It’s planning time! Many homeschool mamas just love the planning aspect of the homeschool year. Other moms want to run screaming in the opposite direction. No matter whether you have a love or hate relationship with planning, homeschool planning can be relatively simple and it is effective and necessary for a successful year! I happen to love planning but I’ve found a way to streamline my planning while keeping our schedule organized. This is a huge step! It takes me months of research to decide on what we’re using. After much angst, I place my order and wait for my boxes to arrive. I create a master list of curriculum. I have a list of curriculum for each child for the year. This list is broken down by subject with each curriculum option listed under the subject headings. I compile a purchase and prep list. I go through all our curriculum and our books and I make a list of what we need to purchase for our next year after reviewing our curriculum list. I also make a separate list of what I would need to print out, cut out, or prep for the upcoming year. I make a master list of read alouds. I have a list of read alouds for each child. I go through my list and enter them into a table in a Word document. This table has 50 rows. We read aloud even during holidays and all through the summer. So this table accounts for 50 weeks of the year – giving me a couple of weeks in case we get behind. I then put the books into the table. I try to schedule the longer books with shorter books scattered in the weeks in between. So, I plan two weeks for a long book, 1 week for a short book next, and then a week where we will read 2 or 3 picture books. I like a large variety in our reading list during the year and I don’t enjoy reading extremely long read alouds back-to-back so I schedule our year to make sure the short books are placed carefully. I make a list of goals. During the summer I write down a list of goals for our school year. Sometimes these are subjects I want to make sure to add in and sometimes they are skill-based goals like teaching my children how to take good notes. Other goals are more academic such as having my kids memorize the presidents in order. These goals help guide my school year and make sure that I don’t get lost in a sea of curriculum or other activities – I know my year is successful if we’re working toward each of those goals. Plus, it helps me see progress as we start meeting some of the goals. I choose our calendar year. We school year-round but we have 3 semesters: Sept-Dec, Jan-April, and May-August. The first two semesters are our true school year. The summer semester is for extras and anything that didn’t quite get finished. This schedule has worked well for us – we start after the schools here and we end our year long before they are finished. But I know that we won’t be short any days because we will be doing art, science, and read alouds in the summer and those days will count toward school as well. I print off a blank calendar for our school year and plan our weeks. I use the free printable templates found here. Then I go through the months of each semester and count the number of weeks. I aim for 12-14 weeks of school each semester. I plan for 3-4 weeks off in each semester to account for holidays and sick days (or days that we just need a break). On these blank calendars I mark off the weeks that I know we will not be doing school (Thanksgiving, Christmas, Easter, etc). This still gives me several “floating” off weeks that I can use as I need them. I go through our curriculum and record the number of lessons or chapters. I look through each book that we plan to use and I write down the number of lessons or chapters. Then I compare these numbers to the total number or weeks that we will be doing school in our main two semesters. This gives me an idea of how many lessons or chapters will need to be covered each week in order for the book to be complete by the end of April. I write this number out to the side of each curriculum on our master curriculum list. I know some weeks we will cover more chapters and some weeks will be less. But if I have a ballpark number to aim for each week, I know that we’ll come close to hitting our deadline. I make a schedule for our days. This has been the most helpful tool for our homeschool days. I create a schedule that is divided into 30 minute time segments. I lay out the curriculum lists and start placing all the subjects for each child into my schedule. Yes, it is very hard to fit everything in! I usually make multiple drafts of this schedule and it takes several weeks to find a schedule that works for our semester. I have a slot for each child and myself on the schedule spreadsheet. Each person has their own color so I can quickly see who I’m supposed to be teaching at any given time. I plot out what each person will be doing every 30 minutes during an ideal school day. This helps me insure that each subject does fit into the schedule and nothing is left out or overlooked. I keep a simple calendar. 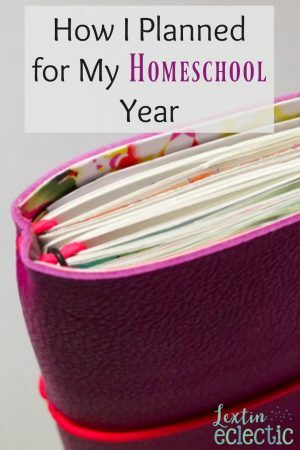 I don’t use a homeschool planner! Did I just say that out loud? Well, I don’t. I’ve tried to use them but I’ve found that they were bulky and it was too time consuming to keep up with them. So, instead I use a cheap calendar that my hubby picked up for me at a local store. On the monthly overview pages I keep a record of all appts and field trips. Then on each weekly page, I can write down specific things we do each week. And I don’t actually write down every page number and every lesson for every day. I keep it basic and somewhat generic. After our curriculum has arrived and I’ve planned the basics, I create notebooks for my kids. I have one notebook per subject for each child. Yes, it’s a lot of notebooks but I don’t want to combine subjects and have giant notebooks that are too difficult to carry. So, I put pretty binder covers onto the front of each and I make sure they are clearly labelled with the child’s name and the subject. Then I put tabbed dividers in each notebook. Some notebooks are divided into sections by curriculum – because we are weird and sometimes use multiple things for one subject. Other notebooks have dividers for the different aspects of a subject like grammar, spelling, handwriting, and composition. I print and print and print ahead of time. I go through our curriculum and make sure that everything is printed. I have many digital downloads of workbook pages and notebook pages. I print off a semester’s worth of work at a time. I’ve found that it works best if everything is printed and ready to go weeks in advance. There’s nothing worse than trying to teach a lesson and realizing that you have to wait by the printer. All of my lovely printed pages get filed away into our notebooks. Did you notice that I don’t create a daily lesson plan? It’s true; I don’t. I’ve found that detailed lesson planning is a huge waste of my time. I can’t tell you how many times our plans changed and we covered more or less material that week than I had originally planned. It threw my planning so off that I quit. Now I just write down things as we go, keeping an eye on our targeted number of lessons or chapters to cover each week. And if you need some help evaluating your homeschool, choosing priorities, creating a mission statement, and planning for future school years, be sure to download my free workbook to walk you through the steps to creating your best homeschool year yet! And if you’re looking for more planning and scheduling help, check out the posts below! I tend to print things out a week or two before. I do a combo of daily lesson plans/ record what we do. But I do NOT use paper to plan out the daily lessons and they are not DATED. I use Homeschool Tracker and create undated, resuable lesson plans and I submit them to the assignment grid a week at a time. It drove me crazy to try to use a real planner with paper and pencil! I tried printing as we went last year and I got too lazy. So this year I printed everything! I've also tried to use online or app planners and I'm not good at sticking with them. I love paper and pencil! But I only do minimal planning and mostly just record what we do so I don't do much erasing. As my kids get older and I have more detailed things to plan I will probably have to revamp my system. But for now (with elementary school) this has been working. I try to keep it very simple! Lisa, I've found it best to simplify and streamline. I've tried more complicated systems and I quickly move away from them because they are too time consuming. Keeping a simple daily planner works well for me. And I love not writing detailed lesson plans. It's so freeing! I'm not always organized but I do try 🙂 Wouldn't it be fun if we were closer? Then we could have a homeschool mom's night! Lorie, Good luck with all your planning and printing! I'm glad my steps were clear. How I plan is probably a little different than most but it's been working well here. I appreciated reading this. It's always fun to see how everyone else does their planning. We use and love Right Start too! I'm hoping to start having weekly assignment sheets for my kids. My goal is to have them work independently on some assignments each week. We are starting off with some student planners this year so we can write in assignments as we do. I'm hoping to be organized enough to have them planned ahead of time another year when they are a little older. Thanks! Yes we have found notebooks to be the answer for us to stay organized! They make it easy for me to keep up with our papers! This makes my heart happy. Today, my husband took the day off to run around with kids so I could do some planning and b/c what I was doing wasn’t working I had no idea where to start and this makes so much sense to me! BLESS YOU! You have made my day! I have 4 kiddos 7,7,5 and 1. I’m so glad you found it helpful! I hope you are able to get your homeschool planned for next year! Thanks! So, you basically do the 3´Rs the first two semesters and you add enrichment (science, art, history) in the third? I was planning to do that more specifically this year but was a bit worried my kids will be bored. (81/2yo , 51/2yo and 20 monthes). So glad that I found your blog! The no co-op part spoke a lot to me. Yes. I focus on our core subjects math, language arts, and Bible in the first two semesters. I usually add history in to that plan as well because we enjoy it so much. And in that third semester we do science, art, and some composer study (and lots more read alouds). We do some science in the first two semesters – like reading science books. However, in the third semester we do lots more hands on experiments and things. It has helped to have a rotation schedule like this so our days are not quite so overwhelming. Now that my kids are a little older we do things slightly differently, but that structure worked really well when my kids were young. Hello im considering homeschooling my 4 children. And have one question that im stuck in frustration. How would i homeschool around house cleaning and house work? I dont know how to balance it out even in a tial. Any suggestions? I have a couple of questions- what is the planner you have pictured? It’s adorable! Also, I’m wondering if I might link to this post on my page http://www.HomeSchoolAvenue.com and use one of your photos as a preview image? Thank you! This is the first homeschool planning post I’ve found that REALLY answered all my “but what about…?” nagging questions as a first-time homeschool mom. I’ve never been able to fully transition yet from being a FT public school teacher to a FT homeschool mom in my planning. I either way overplan, creating lesson plans and worksheets and tests OR I just “wing it” daily! I feel like after I chew through your post a couple times, I may actually be on my way to a system that clicks with me AND my kid. Thanks!! I’m trying to homeschool my two granddaughters that I’ve adopted. Both of them have aspergers, and bipolar disorder. I have one who really struggles to learn, and one that is to smart for her own britches, if you know what I mean. It’s a struggle to get them to do any school work at all. I asked the one that is so smart why she doesn’t just go ahead and get it done, that it wouldn’t take her very long to get it all done. She said because she didn’t get to be involved in the planning of her homeschool path. I told her that if she went to regular school, she wouldn’t be able to pick and choose what she wanted. She said that’s why we call it homeschool. We’ve been doing online learning with epic charter school for the last three years. She told me that she was bored and wanted workbooks, so I ordered workbooks from spectrum. I’m still having a hard time getting her to engage, she’ll do anything to get out of doing schoolwork. Believe me when I say that I have taken privileges away and so forth to get her do her work, but it’s just one fuss after another. She’s 10 years old, and has been abusive, physically, and mentally. Please, if anyone has any suggestions I would love some advice. I just wanted to say I’ve been a mess on all this stuff… this specific blog was such a help to help me get my stuff together, figure out what i wanted and needed, divide it up for the year, and boy are we soaring on homeschooling right now! Thank you so much for dumbing it down for me and helping me put it all together the way I wanted to but couldn’t put it together in my head to do. Does that make sense? hehe 🙂 Thank you so much!!! I’m glad you found it helpful! Over the years I have really tried to simplify my planning and I have found that this system has worked year after year. I’m so glad it was helpful! Homeschooling can be a bit overwhelming at first. But once you get going, it’s amazing how things fall in to place. Hope you have a great rest of the year!